Fresh from the wins against Norwich a week ago in the English Premier League and Maccabbi Tel-Aviv in midweek in the UEFA Champions League, Chelsea look set to continue their resurgence as they face Tottenham Hotspur this Sunday away at White Hart Lane at 13:00 GMT. Recall that Chelsea who made it two wins out of two with clean sheets in the bag started this campaign in disastrous form but signs recently show that they have somewhat found their rhythm and will be hoping to make it three out of three against an in form Tottenham side. Tottenham who had earlier in the season sweated over the lack of goals from Harry Kane their talisman have once again been boosted by the forward’s recent run of form and will be eager to unleash him on Chelsea when the two sides meet. 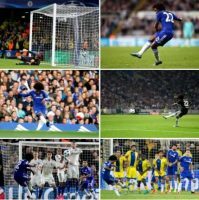 Meanwhile, in Willian, Chelsea boast a match winner and a specialist in dead ball situations as evident in his last six free kicks which he took and scored all…perfect six you might say. In all, the game, a London Derby promises to be entertaining with Chelsea looking to continue their march up the table and into top four. Do you think otherwise? Comment below.